Whatever is the reason, when changing brake, the name that comes in my mind is Power Stop. They have a wide range of brake kits and materials for different types of vehicles. From my experience of using a few brakes, I am writing this Power Stop brake review. I hope it will help you. Power Stop is a brake manufacturer company working on the development of braking materials for a few years. The company is known for inventing and providing affordable brake upgrades for different types of vehicles we use in our daily life. Starting from daily-driven vehicles, Power Stop has targeted track racing cars too. The company has a good reputation for supplying quality braking materials. It produces and supplies brake rotors, pads, calipers, brake shoes, and sensor wires. Besides offering these separately, it offers brake kit in a combination of these separately sold items. In this article, instead of focusing on Power Stop brake pads review or reviews of other separately sold items, I’ll try to focus on the Power Stop brake rotors kit review. So, let’s start. If you are searching for upgrades over the stock brakes of your daily driven light and medium vehicles, let yourself find one of the Z23 from Power Stop. This is one of the best upgrades that will ensure the alow-dust braking performance of your daily driven cars. The kit includes four rotors for both front and rear side as well as sufficient and compatible brake pads for those. The rotors of this kit are made for perfection. These are manufactured using the finest G3000 metallurgy. As a result, OE rotors can easily be swapped with these. So, finding a power stop Z23 brake kit for your vehicle will ensure upgraded performance than OE rotors without any need of modification. The rotors are designed to be safe and effective in braking. The slotted design ensures low temperature at the time of hard-braking situations. On the other hand, the slots on the surface of the rotors ensure easy passing of gas or debris. Besides, the Silver Zinc Dichromate plating ensures that it remains free from rust and corrosion. The brake pads are also manufactured to maintain maximum performance with the rotors. The pads are made of Carbon-Fiber Ceramic to ensure minimum dust at the time of braking. If you don’t like to hear the noise of braking, these pads are made for you with the least braking sound possible. If you want to utilize your brakes to their best, this kit is for you. Looking for a braking kit which can perform better than the OE brakes of your tow or truck? If so, I recommend you to get one of the Z36 kits from Power Stop. These brakes are great to be used in trucks, tow trucks, or vehicles which are driven in mountain areas. With the extreme braking performance, these are able to save you in extreme situations. The kit contains compatible brake pads with rear and front brake rotors. The rotors are made from the finest G3000 metallurgy. These are perfectly made to be used as the upgraded replacement of the original brake rotors and pads which come with the vehicle. The cross drills help those to be cool at the time of extreme braking. For easy passing of gas and dust, the rotors are slotted. As a result, the brake pads get enough chance of better contact with the rotor. The pads are not inferior to the rotors in case of performance. You can easily say goodbye to the unwanted brake dust because the pads come with dust free formula. You can be free from unwanted noise of brakes too as the pads ensure noise free-braking. It also comes with enhanced stopping power without creating disturbance in free rolling of the wheel. The overall performance of this kit is really satisfying. 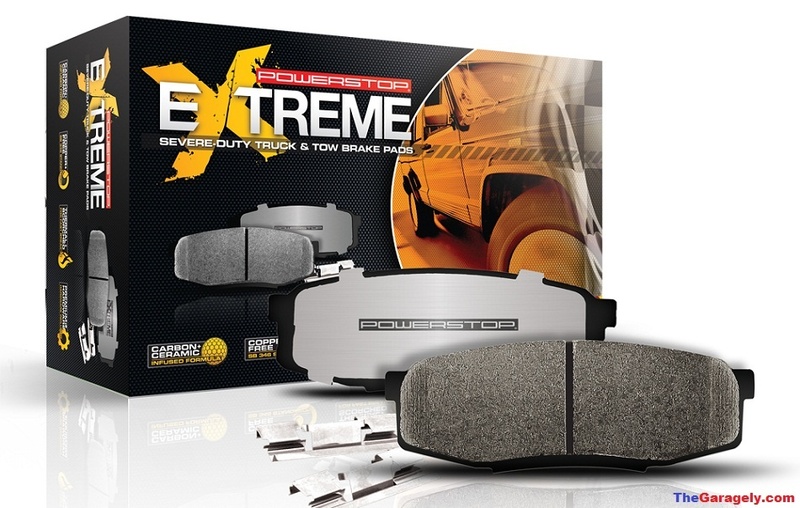 So, if you want a helping hand in extreme driving condition, go on and purchase it. If you are willing to change the brake of your vehicle and looking for a trusted, easy and affordable OE replacement, Power Stop has Autospecialty brakes for you. These are the brakes specially made for being the same stage replacement of your original brakes. So, to replace the brakes without upgrading a lot, you can choose these from Power Stop. The kit comes with four rotors for both front and rear axle and compatible brakes for those. These are good for daily driven vehicles. Stock replacement brake rotors come with this kit are a good replacement for OE rotors. To install those, you won’t have to have a single change in the axle or wheel. Being prepared from G3000 grade castings, the rotors are perfect to be used in any daily driven vehicle in normal roads. The Tru-Cast technology of Power Stop has made the rotors précised made. With the non-directional rotor surface and mill-balanced design, the rotors are good for someone who wants an easy change of brake. While the rotors are made for maximum performance, the brake pads are also designed and manufactured to be the best compatible pads with the 100% mill-balanced rotors. As a result, using this kit for your vehicle saves you from unwanted brake dust and harsh braking sound. Overall, with everything the kit comes with, it is one of the premium replacements for your vehicle. So, before keeping another kit at the first place of replacement list, give a second thought to it. Owning a Power Stop brake rotor always saves you in extreme situations. This KC2010B-36 is one of those brakes on which you can rely. In extreme trucking or towing, the brake is reliable enough to help you. The components are designed to have a load of towing, mountain driving or hauling. Let’s know what has made this brake able to keep the toughness in extreme conditions. Just like other brake kits, it also comes with four brake rotors and well-matched brake pads. You’ll also find brake calipers with this kit. The brake rotors are designed to ensure that the gas or debris become wiped out so that brake performance remains constant. The holes on the rotors avoid temperature in extreme condition at its best. The brake plates are coated with Silver Zinc Dichromate to enhance look as well as performance. Being manufactured by the finest G3000 metallurgy, these rotors are dependable as well. The brake pads are also well made for ensuring maximum performance. These are carbon-fiber made. As a result, you’ll find less brake dust than most other brands. Unwanted noise also remains low at the time of braking in these brakes. So, for smooth braking in extreme situations, you can pick a brake kit of this kind. The calipers of this kit are powder coated. As a result, it keeps the dust away. Besides, it looks great too. Being made with brand new components and high-temperature rubber, the calipers perform well too. When you are choosing a brake upgrade in your daily-driver, you must keep in mind that the upgrade must be a better performer. In that case, I suggest you check KC1683 Z23 Evolution Sport Brake Kit from Power Stop. The kit is manufactured with the best materials to make sure that you get the upgraded performance for which you were waiting. This kit includes four brake rotors, four well-matched brake pads, and brake calipers. The brake rotors are like all other Z23 brake rotors manufactured by Power Stop. With holes, slots, and plates, the rotors are the best fit for your wheels. As an upgrade, each rotor is manufactured to be the bolt-on upgrade for your daily driver. Thus you won’t have to make any changes to install the rotors in the wheels. The brake pads are also made as a great companion of the rotors. The construction of the brakes ensures that braking won’t create unnecessary noise that makes you feel disturbed. Besides the premium construction reduces the brake dust created by strong braking actions. So, you won’t have to clean your wheels regularly. The brake pads ensure these features without hampering the braking performance. I have already said that you’ll get brake calipers with this kit. The calipers are also premium made and designed to work with the wheels of your car without any modification. Power Stop has used a red powder coating to keep corrosion and rust away from the calipers. Simply speaking Power Stop has a good reputation for providing good brake materials. From my experience, this is true. As replacement or upgrade, the brake kits from this company are great. So, I suggest you try one. You won’t forget the experience.